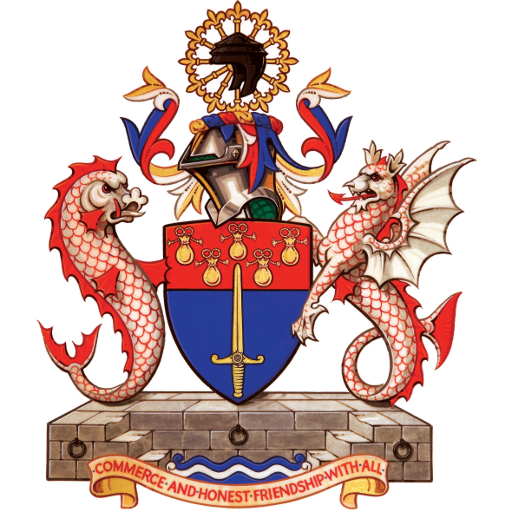 The Worshipful Company of World Traders is a modern, vibrant and active Livery Company working within a fine tradition. Our membership comprises people from a diverse range of professions and backgrounds who come together at our social and business events to enjoy each other’s company and exchange their thoughts and ideas. The Company is one of 110 livery companies based in the City of London. It was first formed in 1985, founded by Mr Peter Drew OBE, becoming a company in 1993. The Company received its Letters Patent in a ceremony at Mansion House, from the Lord Mayor, Alderman Clive Martin on 25th January 2000, thus becoming the first Livery Company to be formed in the New Millennium and in terms of seniority is Company number 101 out of currently 110. At a meeting of the Privy Council held on 10th July 2013 at Windsor Castle, Her Majesty The Queen was graciously pleased to grant a Royal Charter to the Company. The Master’s Badge of Office depicts the Company’s coat of arms mounted on a piece of rock crystal, donated by the World Trade Centre of Rio de Janeiro, carved with an outline of five continents. The Company exists as a body of World Traders in all fields of financial services and trading, including brokers, bankers, accountants and consultants, as well as traders in goods and services. The World Traders’ Tacitus Lecture was inaugurated in 1988 and is now believed to be the largest event of its type in the City of London. It is held annually and provides the Company with an opportunity to demonstrate to a wider audience its concern with issues affecting world trade. This notable event has attracted important speakers of prestige and distinction in diverse fields concerned with world trade. We also host a diverse variety of other events – both informal and formal – for our members. Almost from their earliest times the ancient guilds undertook a responsibility for the education and training of young people. We are no exception, and are proud of the funding we provide to this sector.